A stand of Ponderosa pine trees near Winthrop that was commercially thinned in 2012 is an example of thinning planned for the Mission Project area. As soon as this fall, commercial thinning will begin on thousands of acres of U.S. Forest Service land in the Libby Creek watershed as part of the Mission Restoration Project, which got final approval in July to move forward. The Mission Project plans commercial and non-commercial thinning, prescribed burning, soil treatments and changes to Forest Service roads on 10,022 acres in the Libby Creek and Buttermilk Creek drainages. The primary goals of the project are to improve forest health and help forests better survive disturbances including wildfire and climate change. The project has a 15-year timeframe and will take place across a landscape of 50,200 acres, with about one-fifth of the total area treated with thinning and prescribed burning. The project has moved through environmental analysis and public comment since April 2016, generating more than 900 comments. On July 20, Okanogan-Wenatchee National Forest Supervisor Mike Williams issued a final decision and a “Finding of No Significant Impact” for the project. The first commercial timber sale for the project is being advertised, and will entail harvest of 6 million board feet of timber in the Libby Creek drainage, said Holly Krake, a public affairs officer with the Okanogan-Wenatchee National Forest. Commercial thinning for the entire project, including both Libby and Buttermilk watersheds, is expected to produce 8.1 million board feet with a value of more than $3.2 million, Krake said. 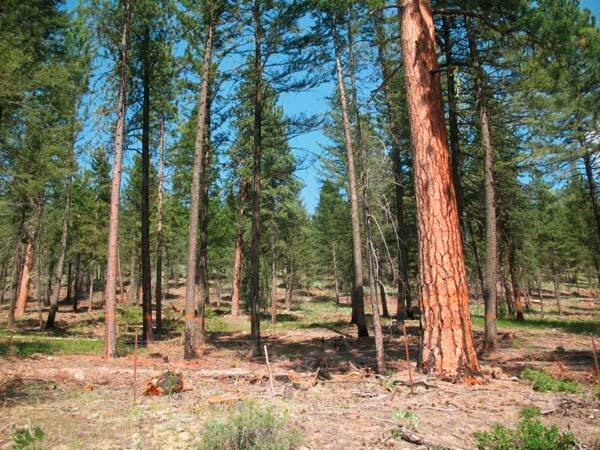 The first timber sale is a “stewardship sale,” which means the Forest Service will use the proceeds from the sale to fund other restoration work called for in the project, such as road decommissioning, tree planting and culvert repairs, Krake said. The commercial thinning work will take place in the Libby Creek drainage over the next three years. Much of the work in the Libby Creek timber sale will be done during winter. A second planned stewardship sale would remove about 2 million board feet from the Buttermilk Creek drainage, with harvesting done in either summer or winter, Williams said in his decision. Commercial thinning is planned to take place on 1,853 acres over a three- to five-year period, and non-commercial thinning is planned on about 8,300 acres over 10 to 15 years, according to the Environmental Assessment (EA) prepared for the project. Firewood cutting opportunities for the public will be offered when feasible after thinning operations, she said. In areas that are commercially thinned, an average of 20 to 50 large trees per acre will remain, and in areas where non-commercial thinning occurs, 20 to 100 large trees per acre will be retained, Krake said. Of the total 50,200 acres in the project area, about 23,000 are considered to be in the wildlife-urban interface (WUI), where forest lands abut residential areas. Almost 30 percent of that WUI area, approximately 6,800 acres, is within thinning and prescribed fire treatment units, Krake said. Prescribed fire will take place over the next 15 years on virtually all the thinned land, about 10,200 acres. No more than 2,000 acres will be burned each year, Krake said. In addition to thinning and prescribed burning, the Mission Project includes actions focused on improving aquatic ecosystems in the Libby and Buttermilk watersheds. The project assessment calls for treating compacted soil on 468 acres; replacing 23 culverts, including eight that are barriers to fish passage; enhancing beaver habitat in eight locations; replacing a bridge across West Fork Buttermilk Creek; restoring woody debris in some streams to improve fish habitat; and installing rock armoring or fords at 10 stream crossings. Another primary component of the Mission Project is road improvements, including decommissioning 34.28 miles of the total 134.7 miles of roads within the project area. After the project is completed, 66.1 miles of roads will remain open, which includes 15.4 roads that are closed except for administrative access. Williams’ final decision maintained a previous decision issued in March by Methow Valley District Ranger Mike Liu, which selected Alternative 2, one of three options (including no action) outlined in the Mission Project EA. Williams made three modifications to that alternative. They included decommissioning an additional .68 miles of roads and authorizing use of lignin, a non-petroleum-based product, for dust abatement during the project on some roads that are more than 100 feet away from fish-bearing streams. As part of the final decision, Williams also approved a “project specific” Forest Plan amendment that reduces total deer winter range cover requirements from 51 and 35 percent to 33 percent in two winter range management areas, a total of 388 acres. The two range management areas are located in the lower elevation of Libby Creek, Krake said. The design of the Mission Restoration Project is based on the Okanogan-Wenatchee National Forest Restoration Strategy, developed in 2012. The Mission Project is the first to implement the strategy, which calls for treating large landscapes with the goal of returning dry forests like those around the Methow Valley to conditions that make them better able to survive wildfire, insects, disease and climate change. The strategy emphasizes an integrated approach to restoration that considers vegetation, wildlife, hydrology, road management and habitat across large watershed areas. Forests have been altered by human actions, particularly Forest Service practices of suppressing wildfires since the 1940s, Forest Service officials say. Historically, portions of the Libby Creek and Buttermilk Creek watersheds would have experienced fire every 5 to 15 years, clearing out smaller trees and brush and preventing extreme wildfires. “Past management practices, including fire suppression, changed forest vegetation structure,” resulting in “densely stocked stands … arranged in a more continuous or unbroken pattern across the project area compared to historical conditions,” Williams wrote in his decision. Those changes have made forests more vulnerable to fire, insects and disease “associated with a warmer, drier climate,” he said. To plan the Mission Project, the Methow Valley Ranger District partnered with the North Central Washington Forest Health Collaborative, which represents diverse groups with interests in forests, including tribes, environmental organizations and timber companies. The collaborative hired an outside forestry consultant from the University of Washington to develop specific prescriptions — to the level of single trees and stands of trees — for treatments that consider historical conditions and incorporate anticipated impacts of climate change on the future health of the forests. Proponents of the Mission Project and the underlying restoration strategy have described it as a shift from the Forest Service’s past model of timber extraction to one of restoration, guided by science. Plans for forest restoration have been welcomed by some people living in or near the Mission Project area, including residents living near Buttermilk Creek off Twisp River Road, who asked that forests adjacent to their neighborhood be included in the project area. Some residents, however, have been skeptical of the project since it was introduced, saying the underlying goal is harvesting timber and the Forest Service has overstated the project’s ability to protect forests against extreme fires. Frue and others have also questioned whether the project can stop the progression of wildfire or reduce the impacts. “During extreme fire weather, no amount of logging will stop the rapid progression of wildfire,” Frue said. “Overstory treatments are controversial in their effectiveness at modifying fire behavior (and) commercial thinning can increase the speed at which fire travels through the forest,” Frue said. “Large, severe fires are endemic to the dry western forests of the U.S. Most of the acreage burned historically every year in the Western U.S. is by a relatively small number of these large fires,” Frue said. “The key to the protection of structures is preparation in the home ignition zone, not logging miles away in remote forest landscapes,” he said. The Mission Restoration Project gets its name from Mission Peak, located on the border between the Libby Creek and Buttermilk Creek watersheds. The project record and decision notice are available at go.usa.gov/xUVqq.